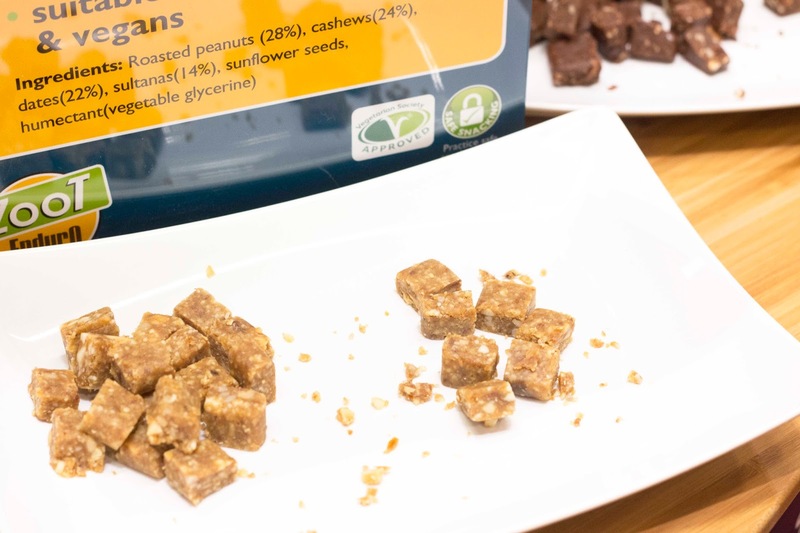 This year’s Natural & Organic Products Show was held at the ExCel London across the 19th-20th April and brings together traders from across Europe and even from America to share their products and expand brand awareness. In the age of social media, bloggers play a huge role in marketing & bringing awareness to new brands, so the lovely Fuel PR and MyChelle team whom I have worked with many times invited me down to learn more about their new launch, and to also experience the trade show and learn more about natural brands – basically, let me bask in my own personal heaven for seven hours. No convincing needed, I was 100% there. 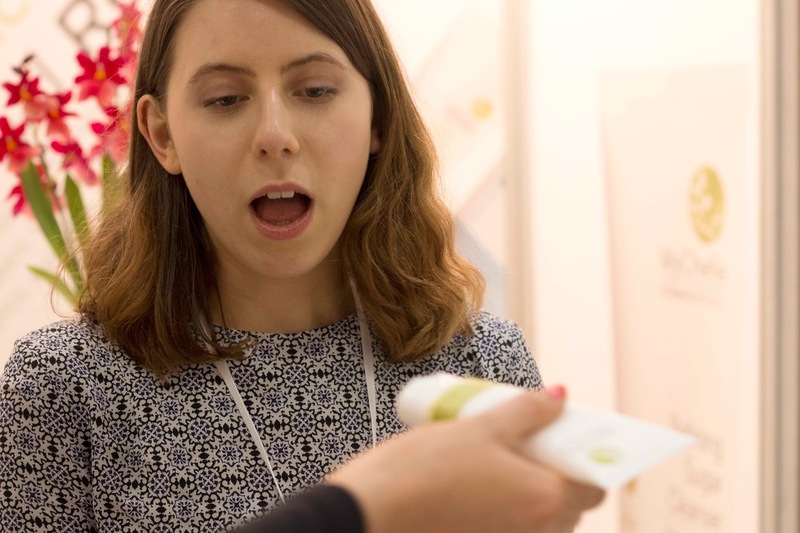 Firstly we met the lovely girls from Fuel PR who I finally got to put faces too (always a treat) and they took us around all their designated brand stalls. 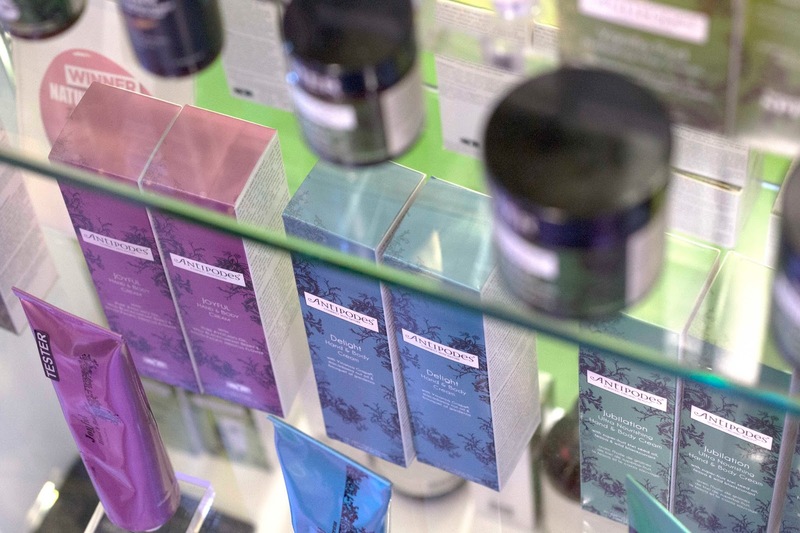 It was great to see brands outside of those I’d worked with, and with all of them being natural and kind to the skin I was all ears to see how they would differ from the usual rated products on the market. 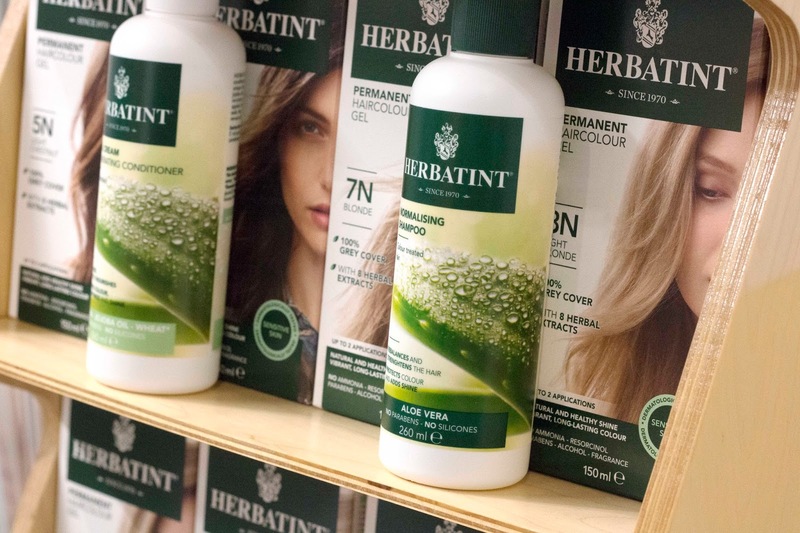 Herbatint was the first stop, an all natural hair dye brand that doesn’t use any nasty chemicals, ammonia or fragrance in their blends, and is so gentle and pigmented you can even use it over henna or chemically straightened hair. As I’m currently growing out bleach, I’ve been putting off a dye job instead opting for a regular chop to keep the damage going out at a speedy rate, however talking to the lovely team has definitely started to sway me into opting for a temporary colour – will it be golden brown or a purple, who knows?! 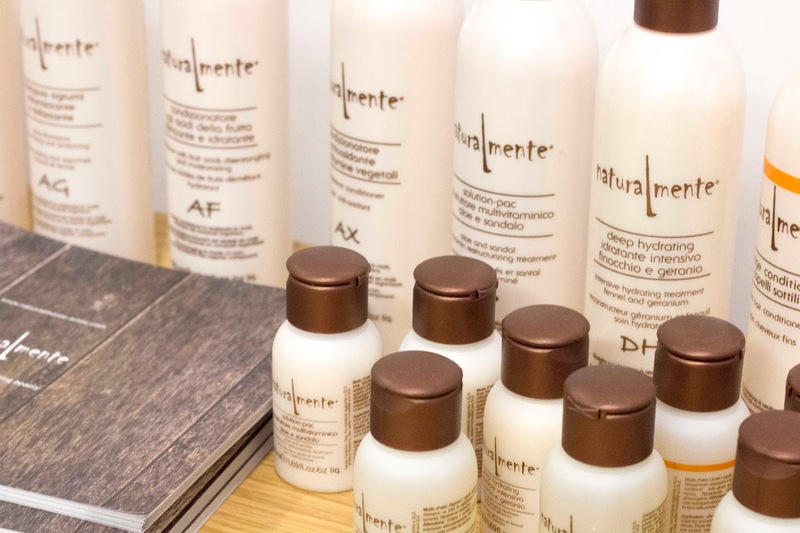 The best thing about the brand is that once you’ve used the colour needed to dye or touch up the roots, you can re-seal the mix, how amazing is that! 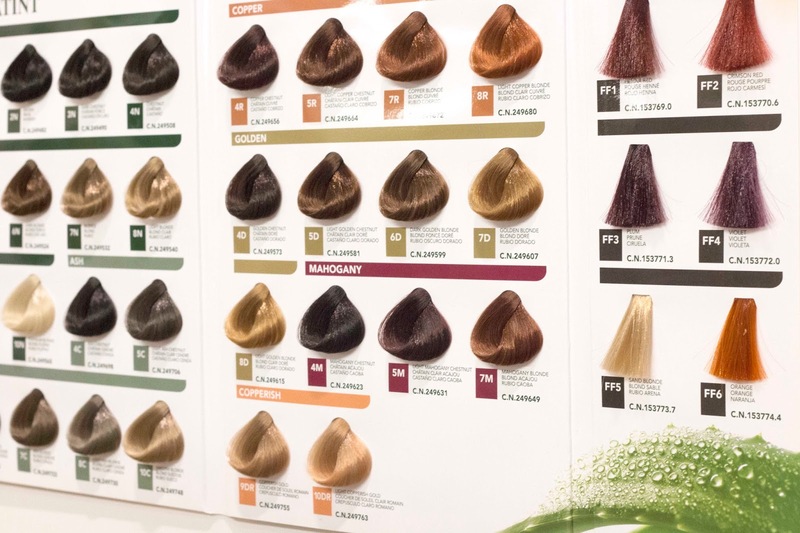 Finally, a stop on wasted hair-dye and over-dying your locks with colour. 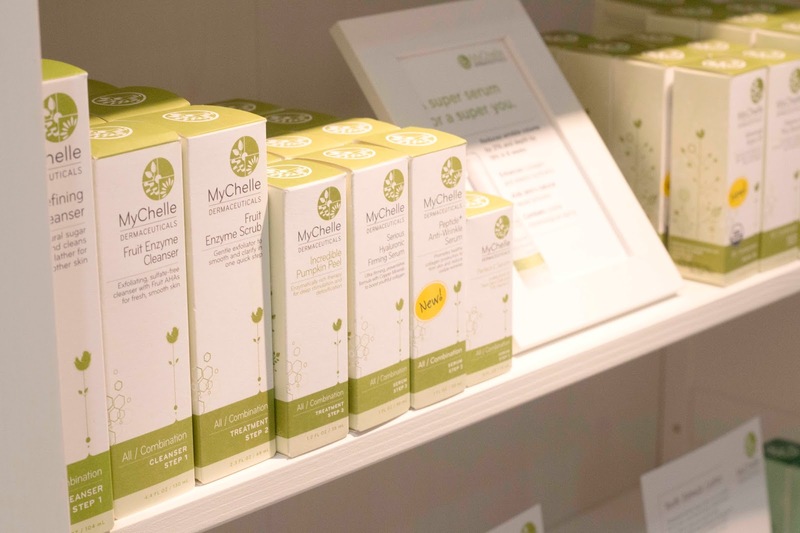 As I said, the main reason we were attending was to visit MyChelle and see their new launches which included the Refining Sugar Cleanser (their biggest cleanser yet) and Remarkable Retinal Eye Cream. 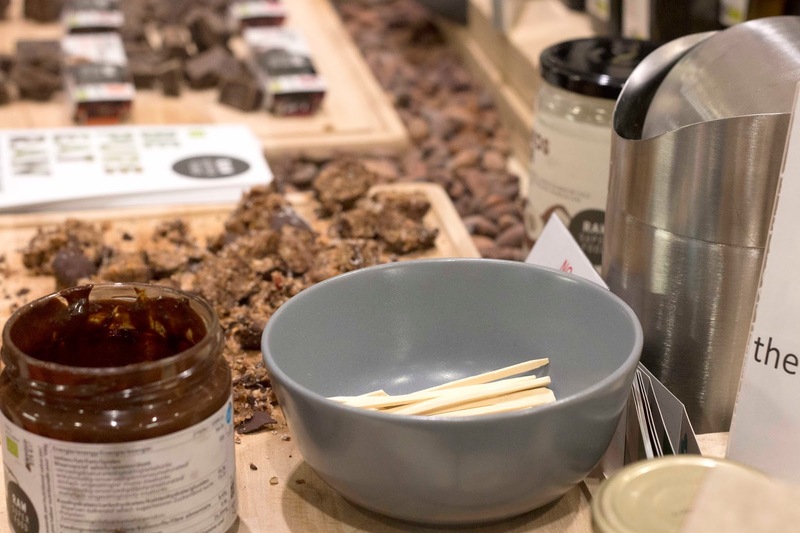 The team had set up an impressive station, packed with all my favourite products and some I am yet to try (forever adding to my wishlist with this brand!) 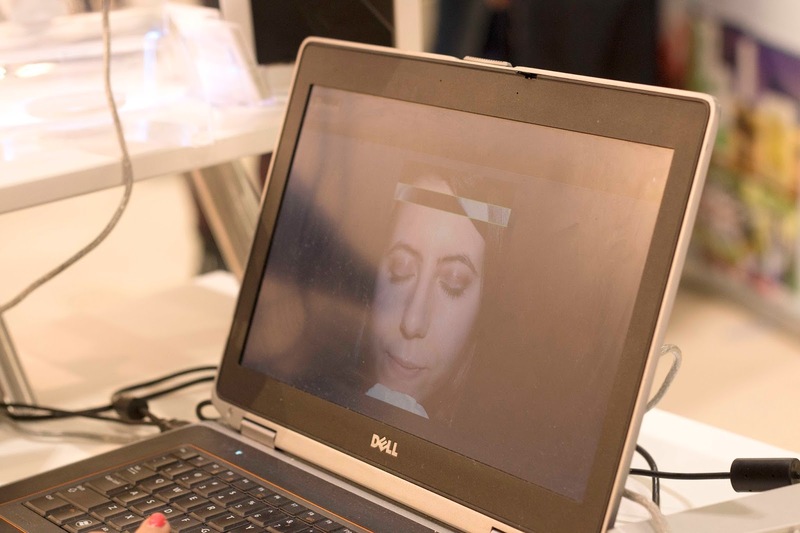 and also a Skin Diagnostic station where you could get an in-depth breakdown of what is going on with your complexion. 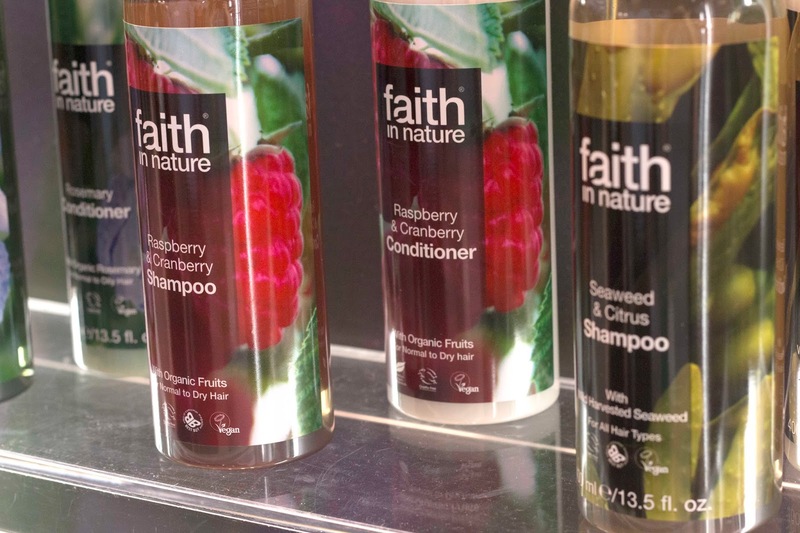 Whilst we were there, we checked out the rest of the Eterno Naturals stand who look after MyChelle and also some amazing upcoming brands; firstly NOAH, and what can I say? I’m a fan. 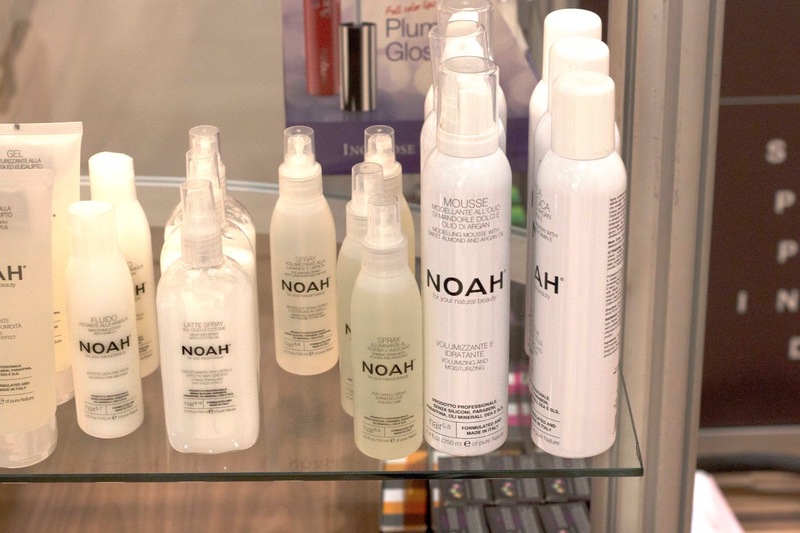 Within minutes I was all over this new launch and we picked up some great products to test before the official launch date – more will come soon, not to be too much of a tease – but to get you familiar, NOAH is an Italian brand that specialises in natural haircare, and importantly highlight that because it’s natural it’s not ‘perfect’ due to it’s unpredictable natural ingredients that don’t contain any chemicals or stabilisers – I would beg to differ on perfection, I am already in love with the Volumising spray. Just to throw something else into the mix, PUR and Royal Green were also on display, both more food based but just as natural as NOAH and MyChelle. PUR currently have a Cinnamon gum which is so exciting for a cinnamon lover like myself, and with my daily bowls of porridge topped in almonds and honey, the Caribbean Royal Honey was a treat to get my hands on – but of course, more on breakfast another time, before I start making us all hungry. 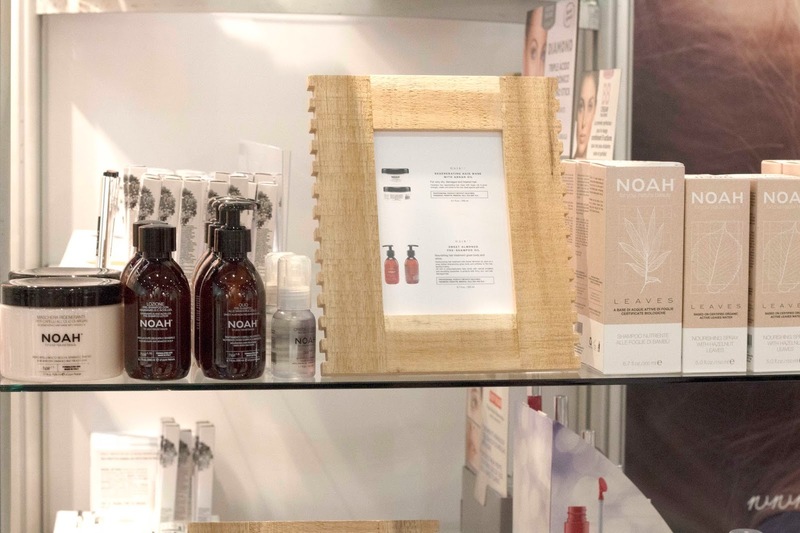 I was so surprised that Fuel PR covered a large range of brands on display at NOPE, and I was delighted to see the Hurraw! Lip Balms which you all know by now are my absolute favourite balms. 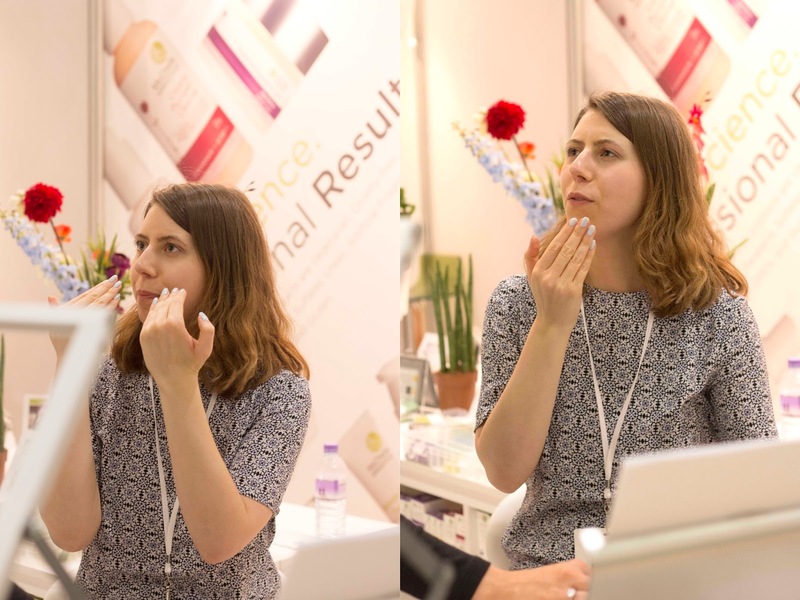 The range of flavours is incredible and being all natural, raw and vegan makes them super kind to the lips which is what you need all year long – definitely need to try some more. 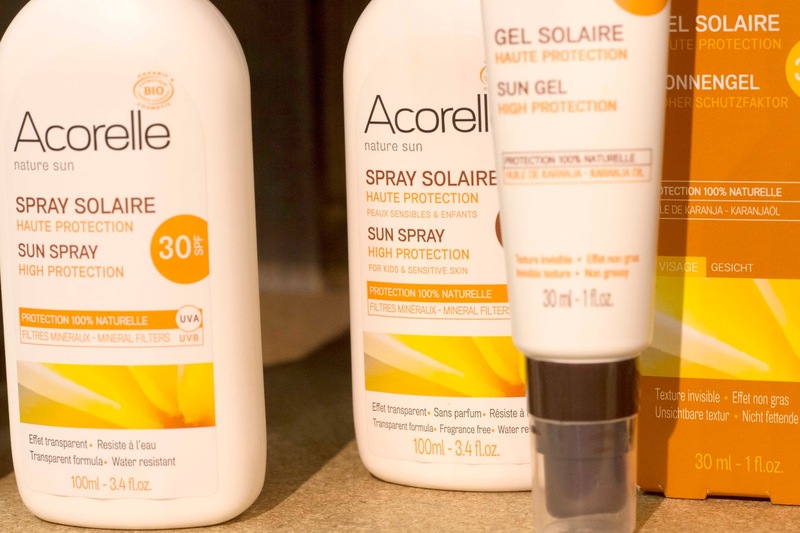 Acorelle and Madara were both brands I hadn’t heard of but are managed under Fuel PR, and Acorelle was one of the only brands I saw displaying natural sun cream on the day, something I’ve been looking for recently after years of reactions to thick formulas and outbreaks which isn’t ideal in the summer months. 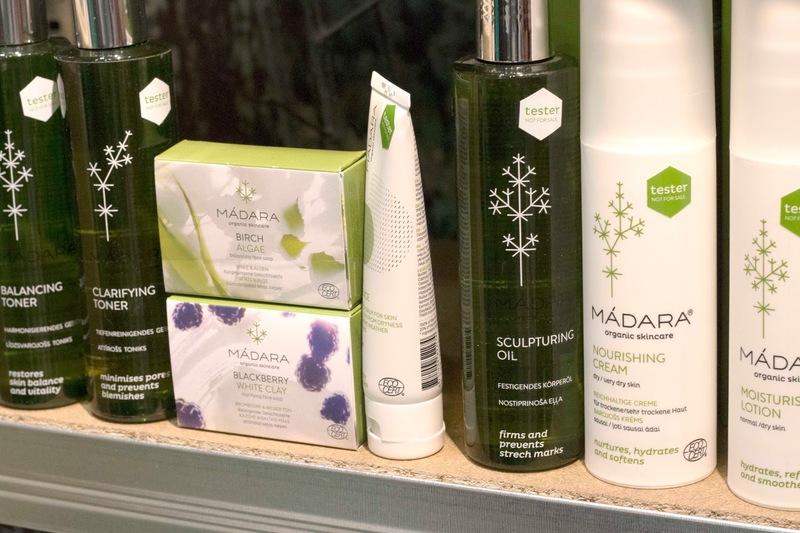 Madara’s range of skincare was incredible, made in Latvia with over 95% natural properties, and even the inclusion of tree sap in the oils making it one of the only non-water based formulas on the market. 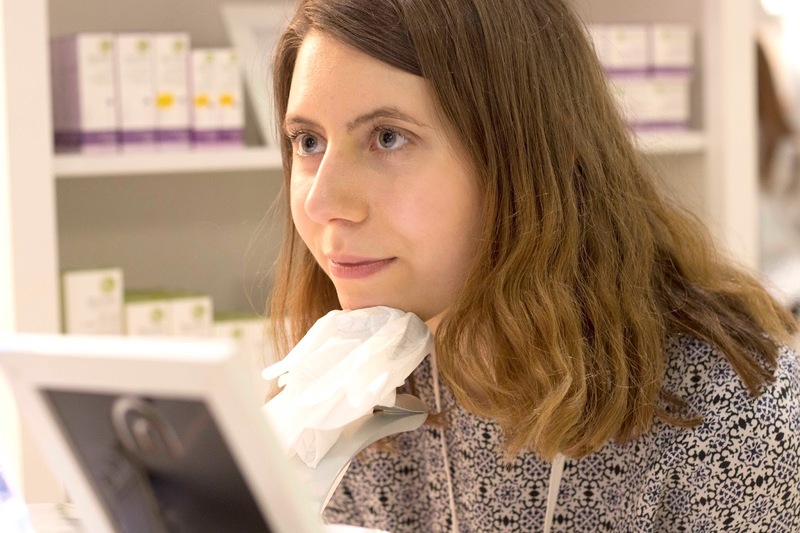 After leaving the team, we rigorously studied out highlighted map of the event (girl’s gotta plan) and head off in search of some skincare, beauty, and food brands we’d bee wanting to chat to. 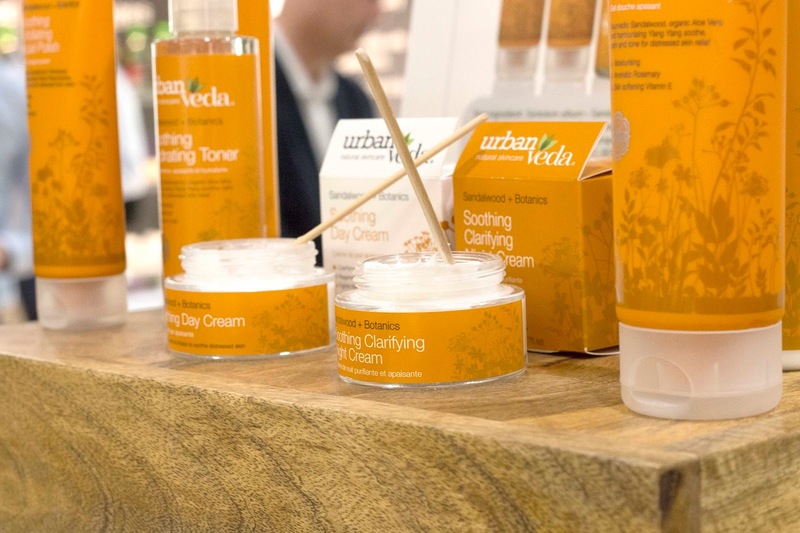 I came across Urban Veda first who has four set ranges of skincare and beauty to suit different types of skin, and the teenage/spot-prone products had an incredible fresh stringent smell to it that would work perfectly in the morning to wake you up – also the packaging is gorgeous, not to be a slave to pretty packaging but it helps! 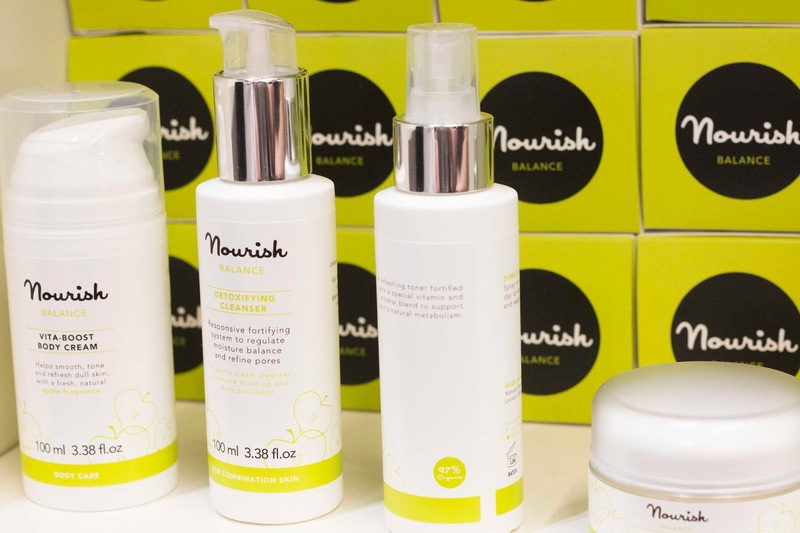 One brand I was really excited to talk to was Nourish, who I have seen all over Kate’s blog for a year now and really wanted to try, because she can just sell a natural product without trying. 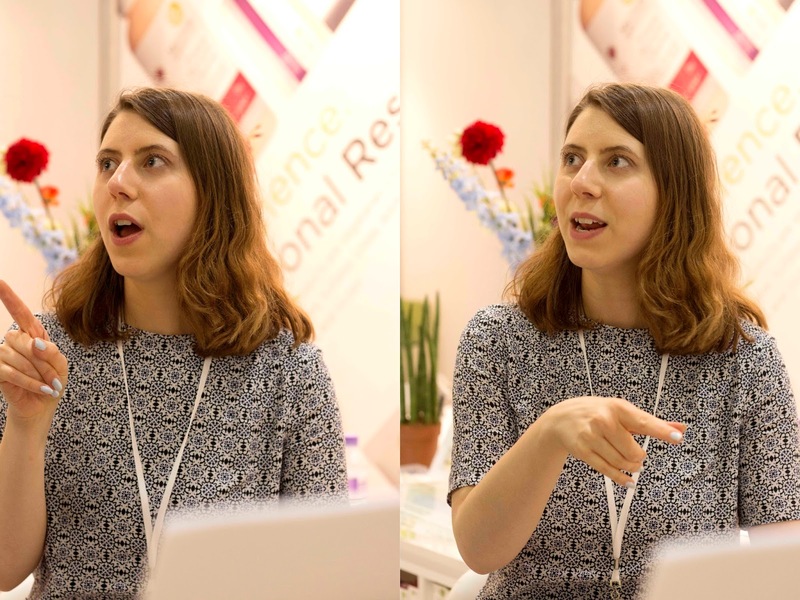 Lydia from the brand was so helpful, and it was great to get all overexcited with others about great smelling, working natural products. 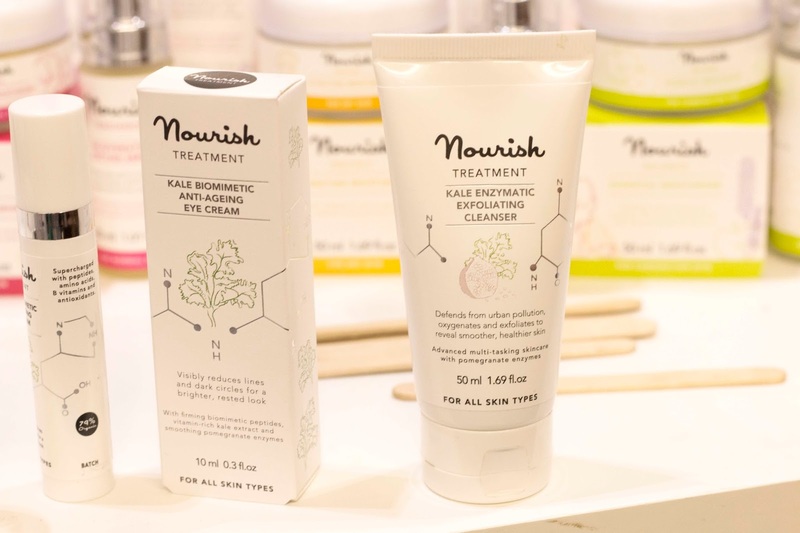 Recently Nourish released their Kale line of skincare which includes an exfoliating cleanser and eye-cream, and the smell is so fresh and clean I would happily bask in it all day washing my face. 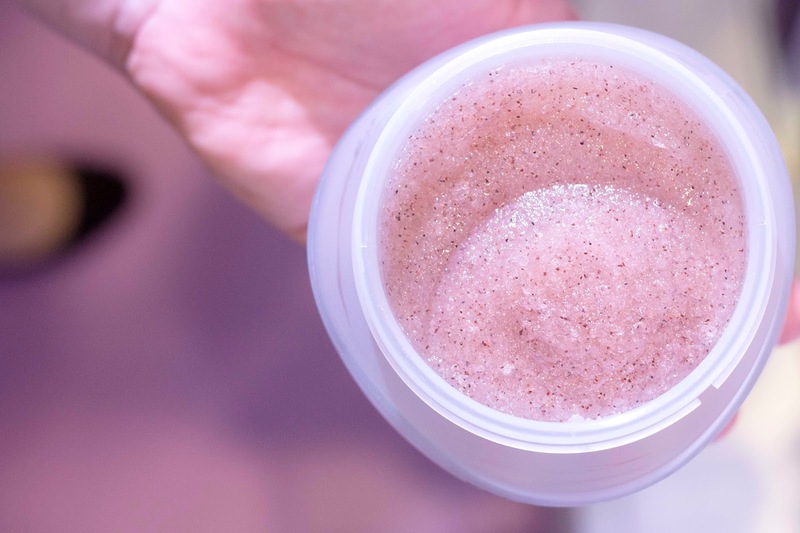 What really caught my eye though was the Golden Glow Illuminating Face Shimmer which absolutely blew me away – it sits somewhere between a brightening balm, a highlighter and a BB cream, creating this absolutely incredible base. My skin looked transformed when I tested it out, and I would probably wear this as a base alone in the summer months, it’s that good. Lydia also recommended the Balance Moisturiser to pop on my areas where bumps and oil are more present (so far, it’s worked a treat, but more on that soon!) and as with the rest of the range, incredible smell! Right in the heart of the event was the biggest collection of brands at a shared station, a true beauty dream. 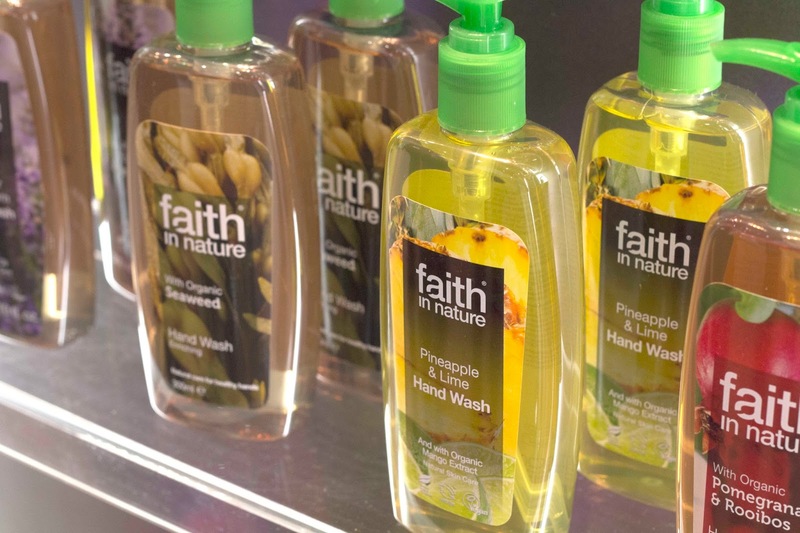 I’ve got sensitive hands and swear by Faith in Nature Hand Wash which is so gentle and kind, so it was lovely to see them at their stand and discover there was more than soap on offer – the Grapefruit and Orange Shower Gel is the freshest smell ever, and it’s quickly made it’s way into my shower gel rotation. Antipodes is a brand I’ve always admired from afar – such Instagramable packaging, and beautiful blends of ingredients you can only dream of. The Joyful Hand Cream is, in short, a joy to apply and smells incredible. 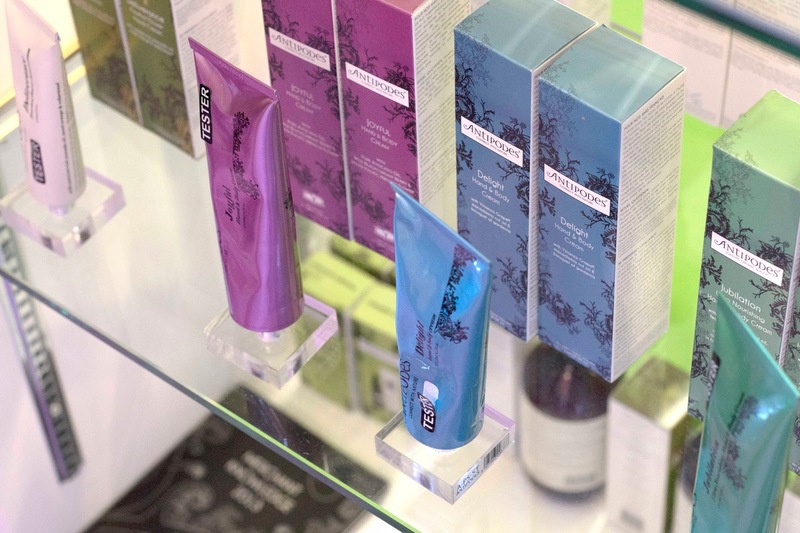 The lovely assistants said that doing facials with the range was always lovely as the blend of natural ingredients smells incredible and are so relaxing – I could only agree, and I’m swiftly adding more of the range to my wishlist. 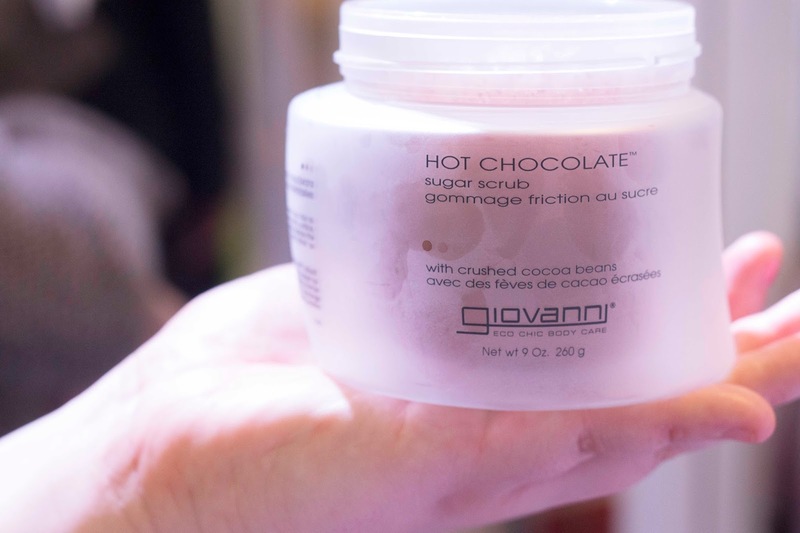 Whilst I was lusting over Antipodes, Angelica had found Giovanni, a natural hair and body brand that she had worked with before, but they completely pulled it out the bag for me with two body scrubs – a Lemonade scented scrub that smelt just like freshly squeezed lemon and sugar, and the most amazing Hot Chocolate scrub that it smelt like a freshly melted batch of dark chocolate and I had to stop myself from rubbing it all over my body right there and then – this stuff needs to be in my bathroom as of yesterday, incredible! 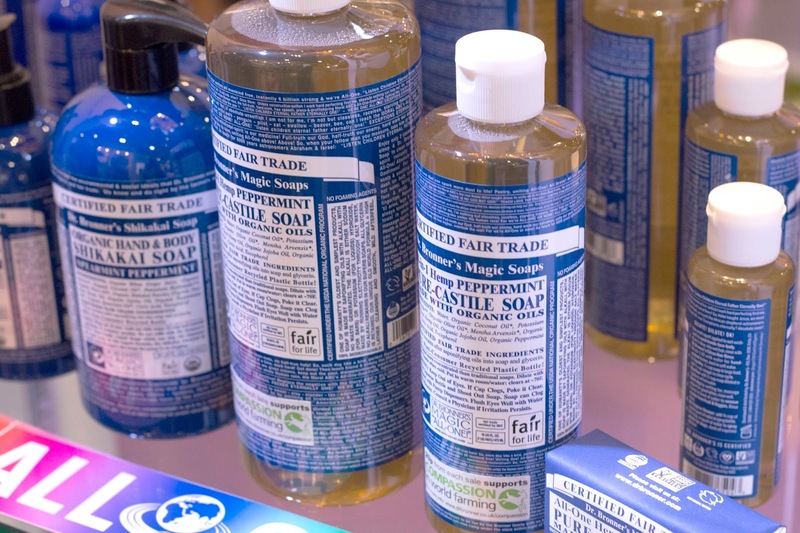 Of course, you can’t go to a natural beauty event and not stop off at the beauty blogger cult brand Dr Bronner – the ultimate make-up brush cleansing product, I swear by the Tea Tree range. 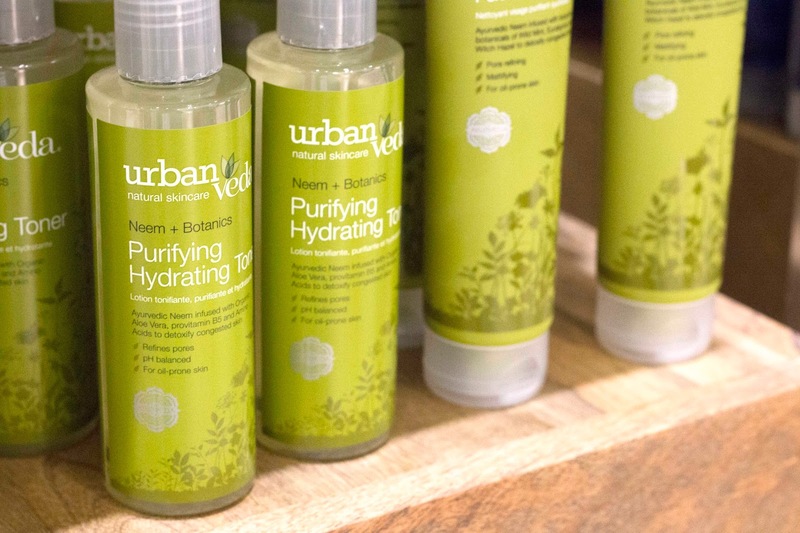 It was lovely to meet the team who all gave us their personal recommendations on favourite formulas – Hemp and Eucalyptus were big hits, and I love a fresh start to the morning so I picked up some for myself in a perfect travel size. 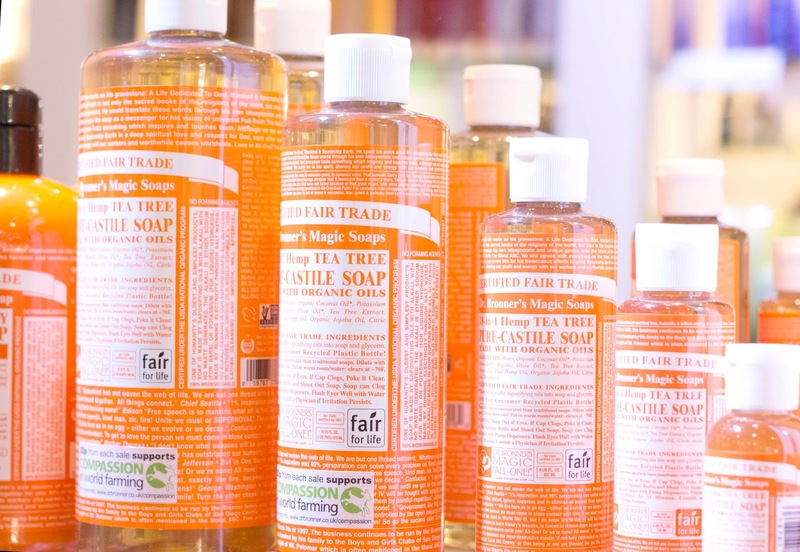 The miniature sized bottles are perfect for travelling or backpacking as it’s multi-purpose – washes your hair, your clothes, plates, face, anything that needs to be cleaned all from one bottle! Finally we visited my heaven, the food stands. There was absolutely everything you could dream of on display, from the Vegan Society dishing out bags filled with vegan delights – there was even a Sweet Freedom Choc Shot in there which made me so happy, and once of the best Cacao and Spirulina Bars from LoveRaw, finally some snack bars that taste good and are healthy! 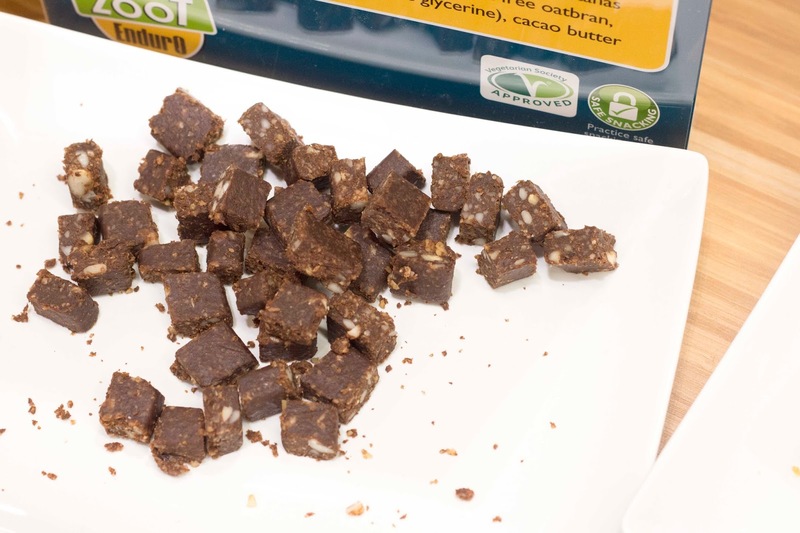 Snack bars seemed to be my biggest pull of the whole day, I couldn’t escape them – nor did I want to, I need more healthy snacks outside of my regular handfuls of almonds, and I was not disappointed. Firstly Chimpanzee had the most incredibly delicious Lemon Bar which tasted exactly like Lemon Drizzle cake, even down to the texture. 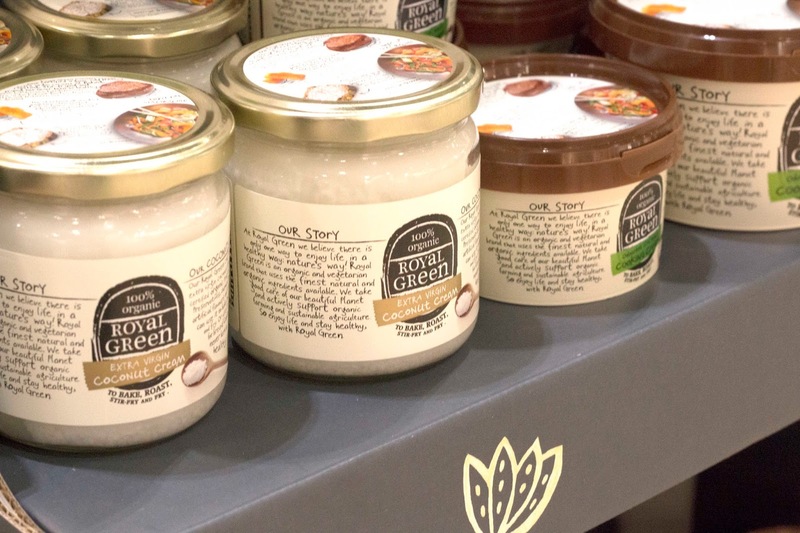 The variety of flavours was incredible, and it would be awesome to see this Czech brand in more health food stores as I loved all the ones I tried. 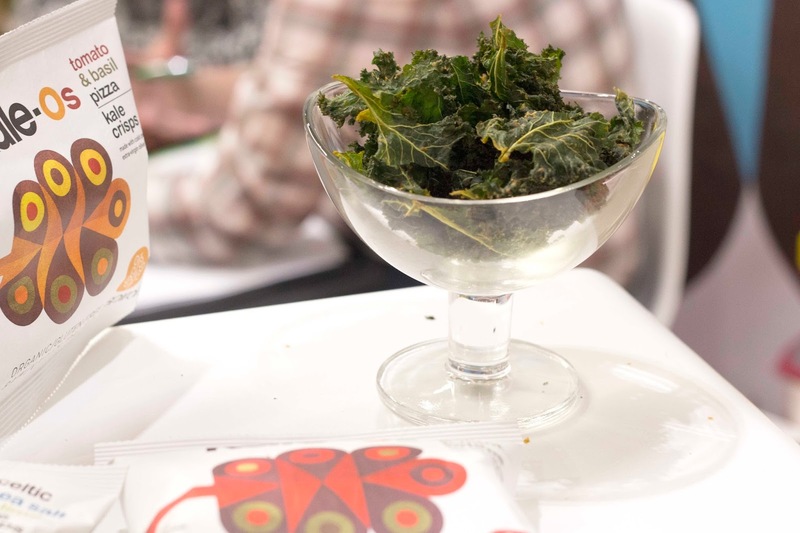 I’m a big fan of kale and kale chips, but without a dehydrator I can sometimes end up with ‘extremely roasted hollow kale leaves’ which taste okay but are nothing in comparison to the delights we tried at Inspiral. I have to hand it to them, these were a taste sensation and the Tomato and Herb Pizza Kale-os which are new launch this summer are the perfect pizza hit, especially for someone like me who doesn’t eat pizza anymore but still longs for that Italian base of goodness, YUM. I also picked up a pack of the Sweet Chilli and Mint which are a fabulous mid-morning snack and really kept me going through to lunch. 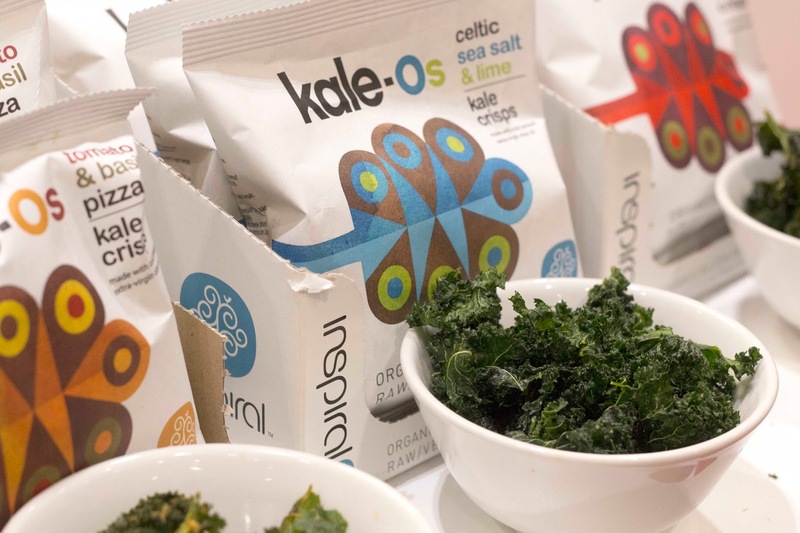 Keep your eyes peeled for these amazing natural crisps when they’re launched, they are unbelievable. 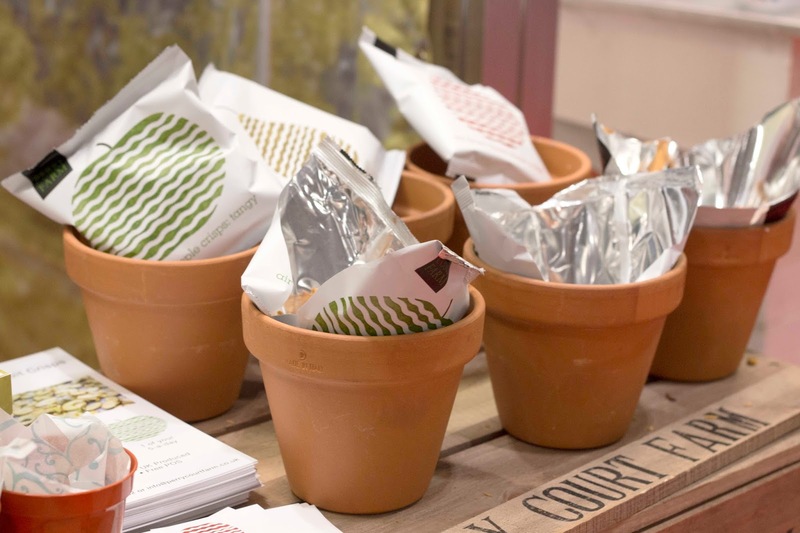 Finding new brands who are in a similar start-up position to you – even though I’ve been blogging a few years, I still feel like I’m only just growing into myself this year – is very refreshing, and I have nothing but praise for Zoot Foods Bars, who within the first minute of talking to them won me over. 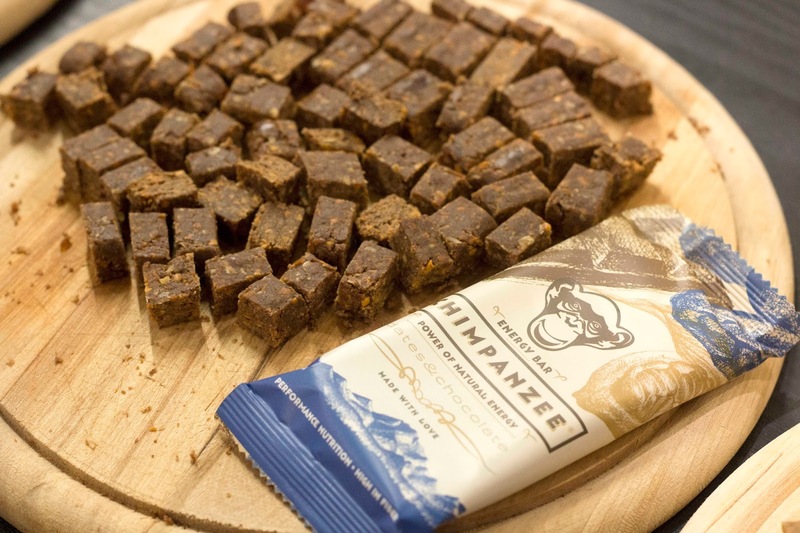 Not only did they have some amazing flavoured bars – the Tropical flavour, oh my goodness – but once I’d mentioned I was vegan, they created me a special pack of bars to try out filled solely with their vegan products – that is customer service and a way to my foodie heart. 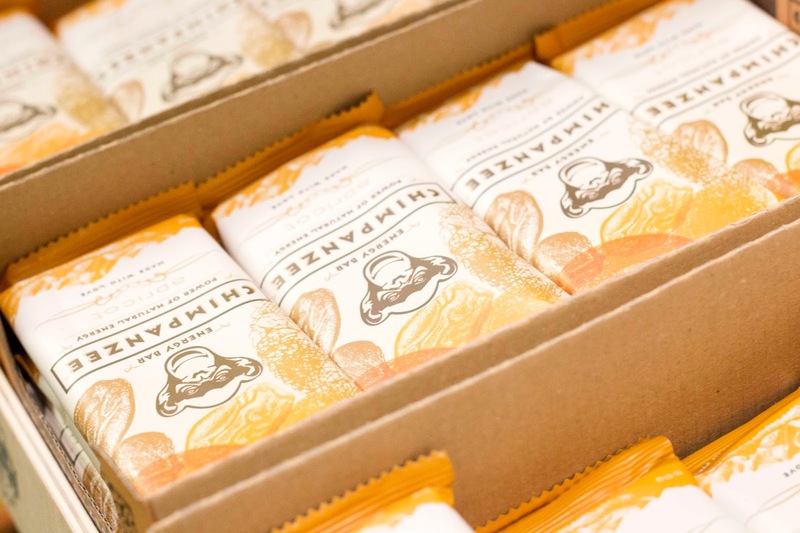 It was great to hear about why the brand was created and the hilarious stories of their past careers, and I can’t wait to try out all of the snack bars – that’ll probably only take three days tops, they are so good and filling. 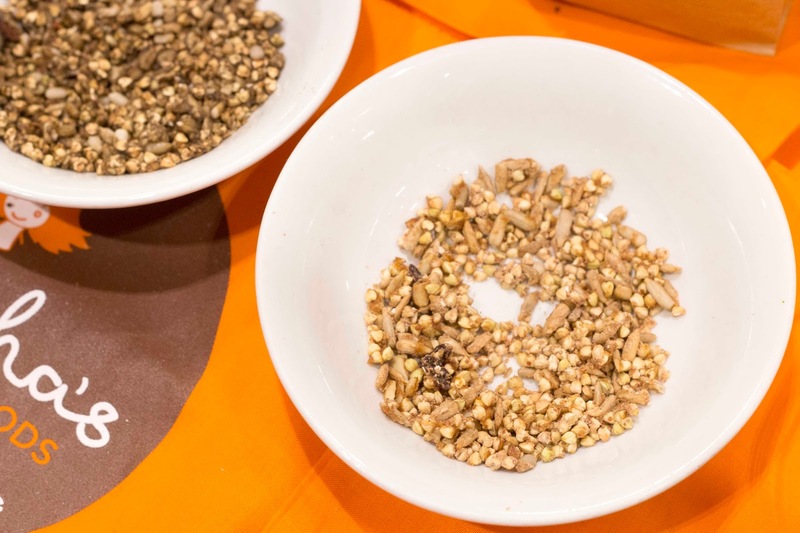 The food section was absolutely overwhelming, there were so many choices and brands to investigate from smoothies and juices to honey and chewing gum. 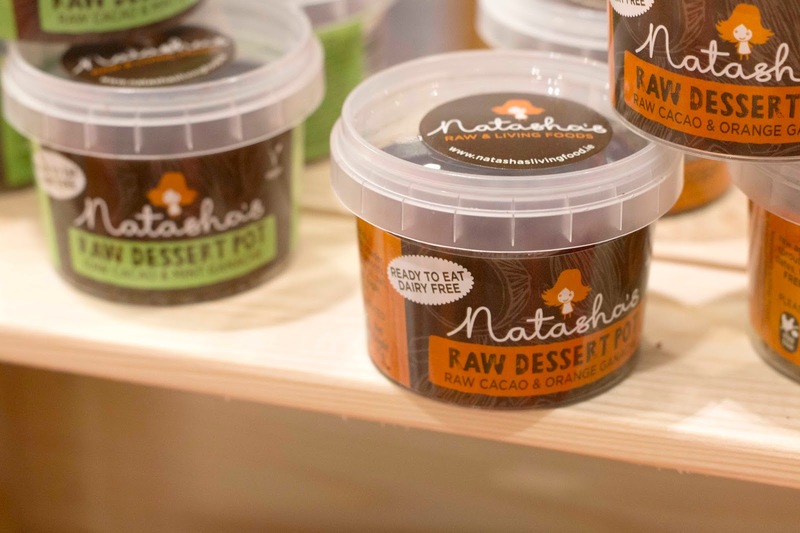 We stopped by Natasha’s Raw Desserts which tasted just like my Vegan Chocolate Fudge but incredibly flavoured with Orange and Mint – we saw so many people get converted to the chocolate delights. There was also Peppersmith who I regularly see on Twitter and their Lemon and Peppermint Mints are such a refreshing sensation, great to cleanse the palette and all naturally sweetened and great for vegans. Before I made a trip to the Mothership (can you guess it yet?) we had a quick pit-stop for some food and spotted everyone testing these colourful pots of frozen smoothie called Frill, a variety of frozen delights that can in a Berry Mix, Fruit and Veg blend, and of course Dairy Free Chocolate. 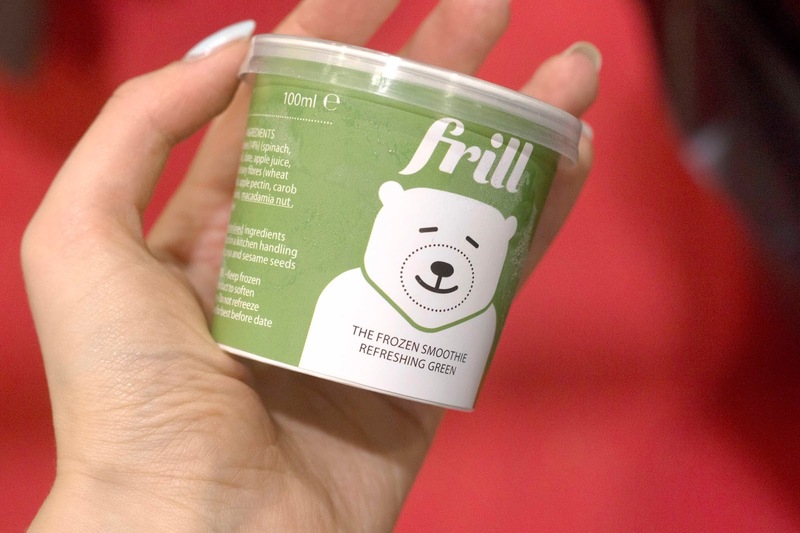 I tried the Green Veg Blend and it was very interesting – refreshing but not too sweet, great if you want something cool on the warmer days that is more nutritional than frozen yogurt or ice-cream. 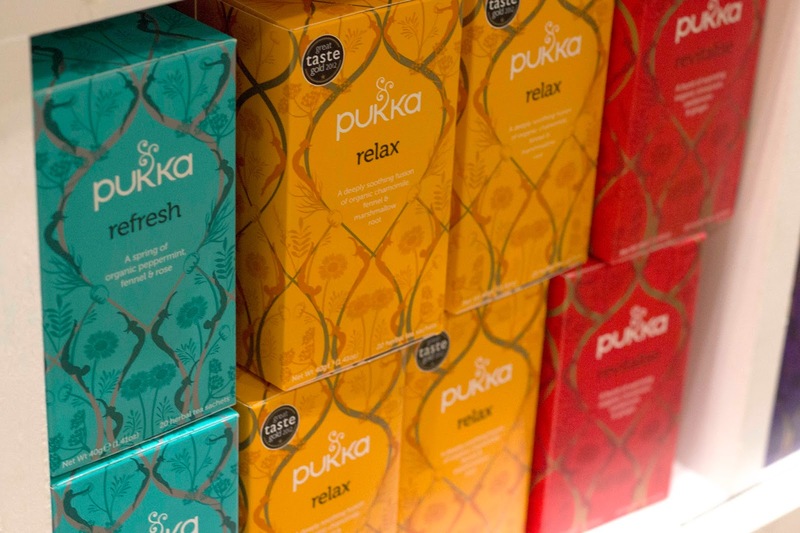 Standing right in the heart of the food sector was the Pukka station and cafe, and I was just overwhelmed by the amount of tea on display. 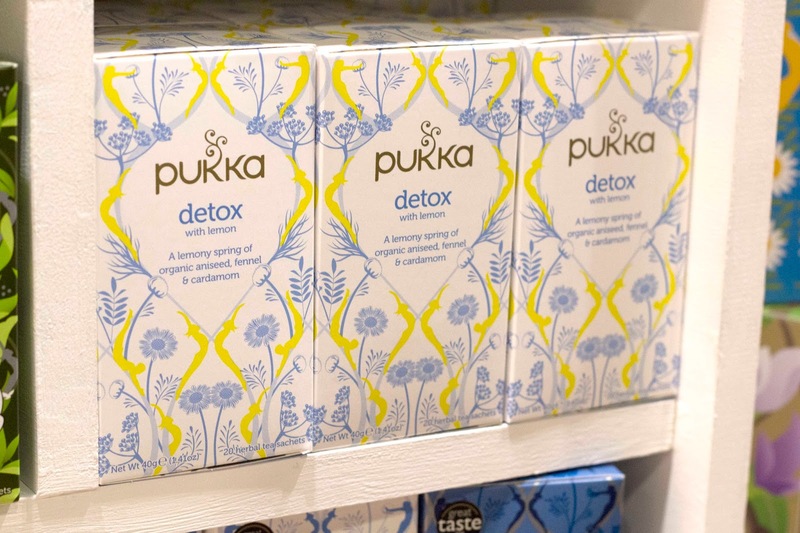 If you’ve seen my Get To Know Me video, you’ll know that all I drink is water and Pukka Tea so this was just my personal heaven. 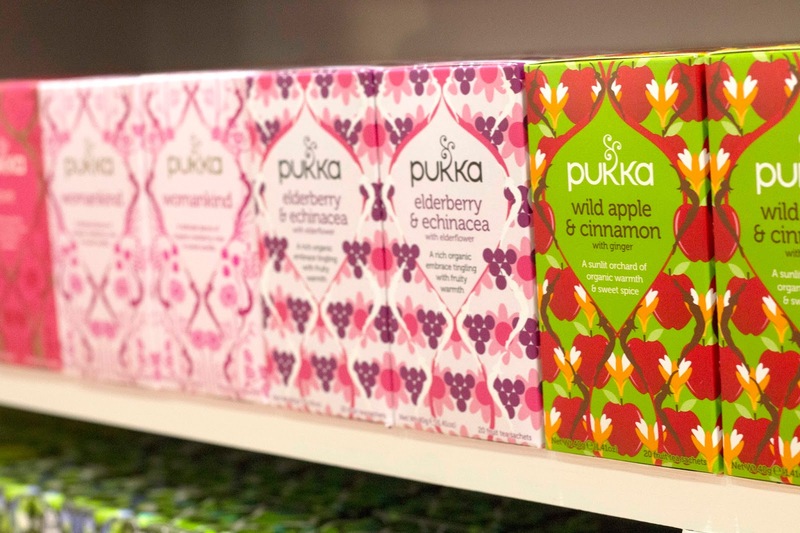 Lines and lines of my favourites teas and one’s left to try, and it was great to speak to some of the team about the products outside the well-know teas including food supplements and vitamins – I’m hoping the Night Time vitamins give me even more sleep, but only time will tell. I was able to pick up some new flavours to try so prepare for another tea appreciation post in the future. Speaking of tea appreciation, our last stop off in the food section was The Tea Factory/Only Natural Products stand where there was a wide variety of Higher Living, Dr Stuart’s, and Kromland Farm teas on show. I hadn’t tried Kromland Farm but they were showcasing their new Rooibos Caramel tea which at first I was hesitant about but it was so mellow with a hint of sweet, delicious enough that I walked away with a box of the Rooibos Cinnamon and Orange Tea to try for myself. Again, tea appreciation post, it’s coming. Fully dosed up on food, we swung back round to the beauty section as the crowds of traders had died down a little and we were able to talk to some people we’d missed first time round. 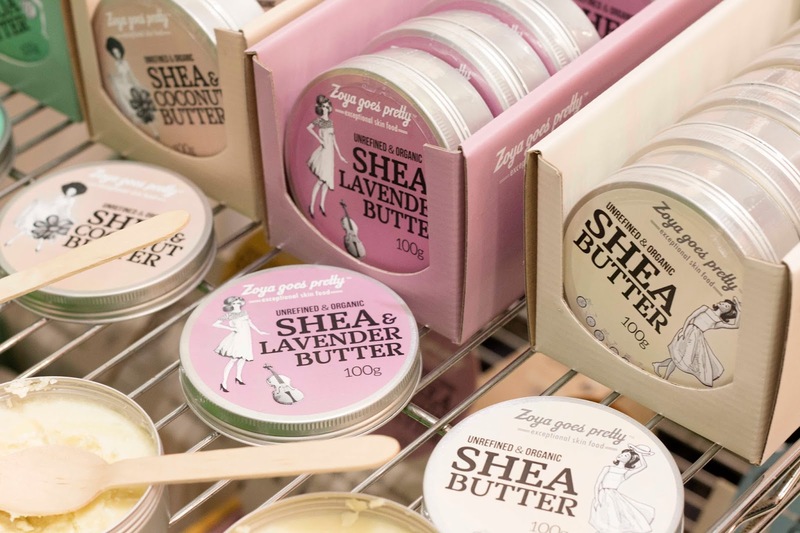 Firstly, can we discuss how gorgeous Zoya Goes Pretty‘s packaging is? 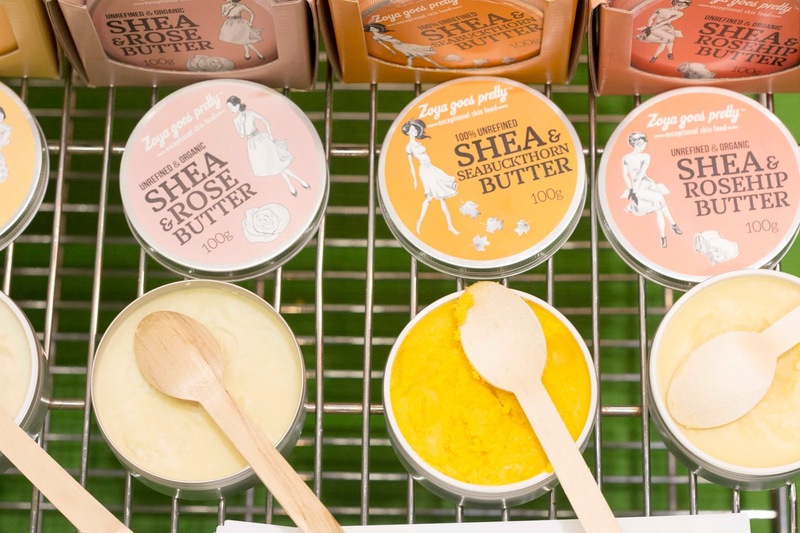 Pastel perfect with intricate illustrations, the natural unrefined butters smelt and felt absolutely delicious on the skin, hopefully they’ll be popping up on the market in the future as I’d love to give them a try this summer. 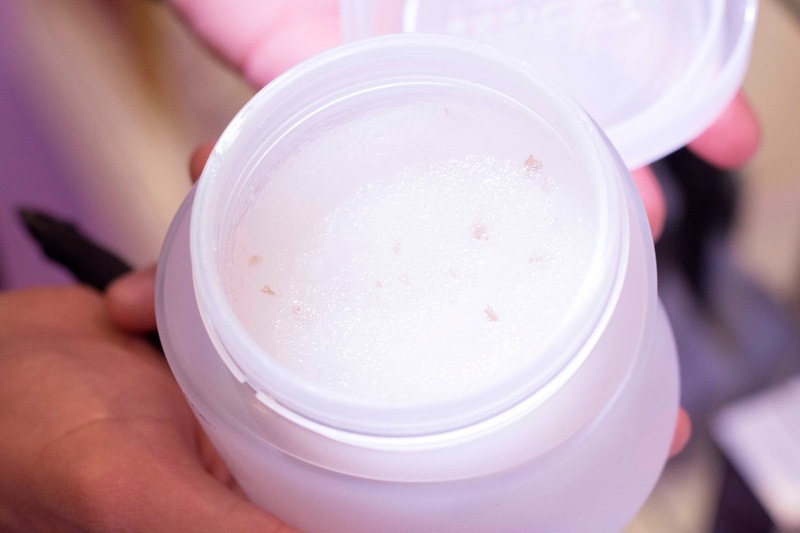 Angelica really was the best at showing me new brands, and I’m so thankful she introduced me to the next two; first Konjac Sponges Co. which specialises in the best cleanse you’ve ever had. 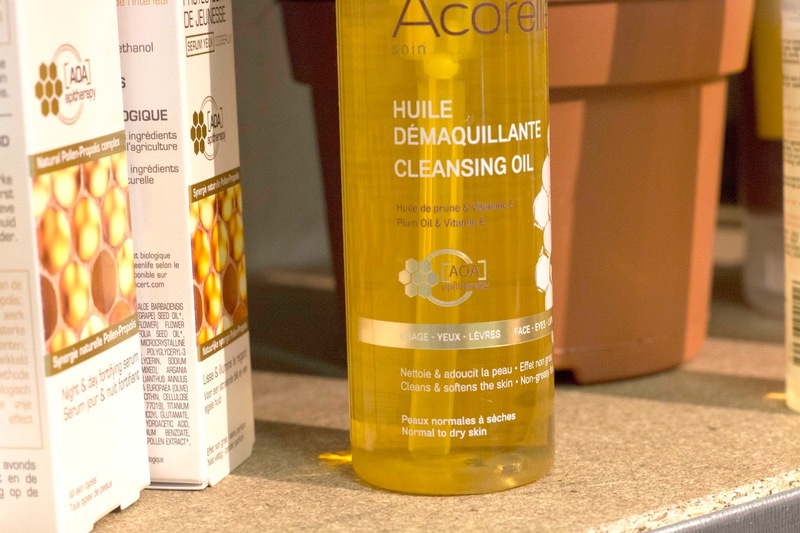 Once I’d revealed I used a flannel/muslin cloth, both Angelica and India looked at me in horror and pushed one of their sponges into my hands to try – I thought I had my skincare down but since using this sponge, I’ve seen how wrong I was even after three days of using it! 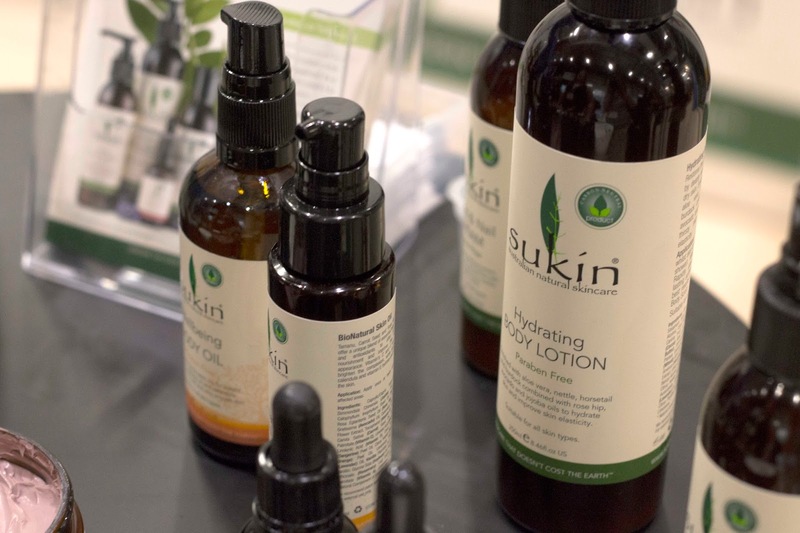 Next up we headed to Sukin Skincare who were launching their Super Green range at the show, and were really informative about how the brand could benefit our skin with natural products. 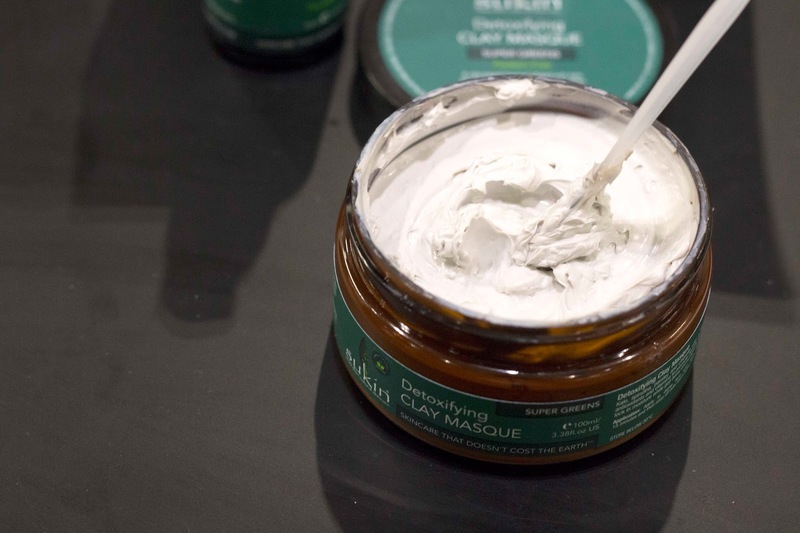 They recommended me the Detoxifying Clay Masque after I said I was looking for the best mask to clear and refine my pores whilst reducing oil – so far, it’s been amazing and an in-depth review is coming soon. 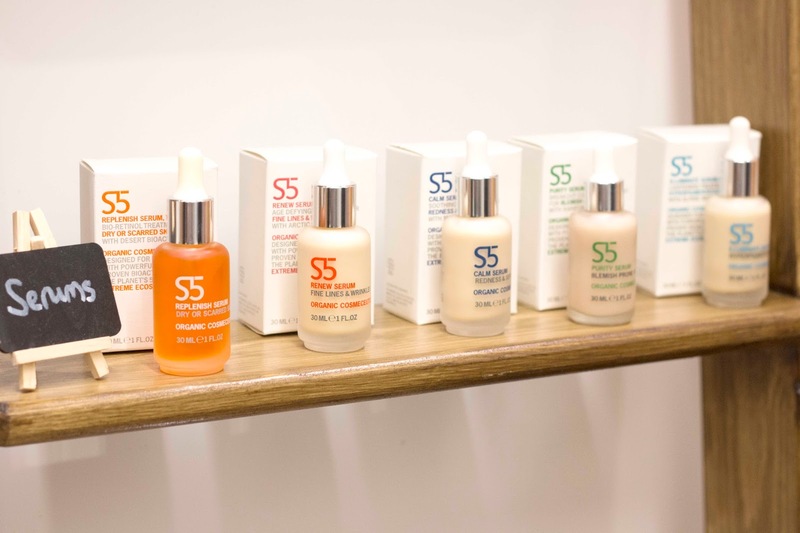 S5 Skincare immediately caught my eye with their sleek, graphic packaging, and the formula was another one to be rivalled. 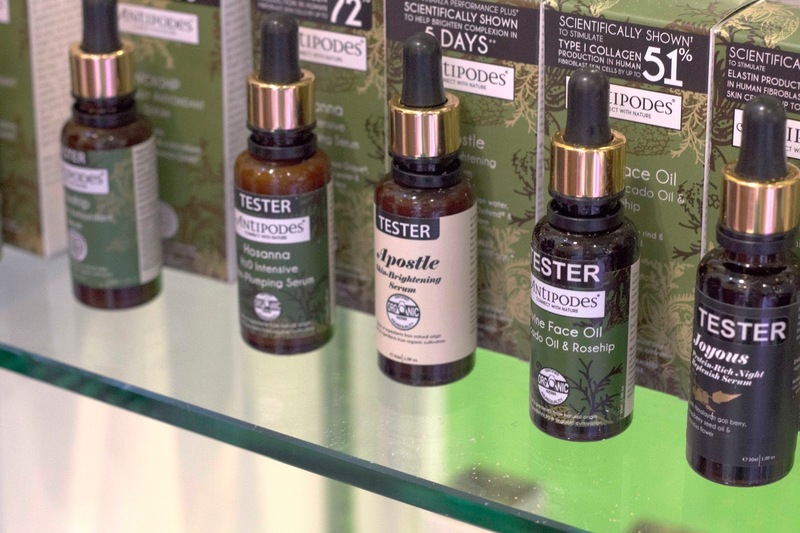 Each oil is representative of our Earth’s 5 ecosystems, from the Sahara Desert to the coldest Antartica, all helping to sooth dry skin or skin troubled with environmental stress. It is such a clever concept and Purity Serum is definitely one on my list, even the name is enough to make you feel refreshed. Overall though, my analysis was more positive than I expected and I can only thank my new skincare regime for that. I’ve been incorporating more natural products in and made sure to stick to a routine, and it’s really paid off even in a matter of weeks. I’m planning on an updated skincare post so you’ll see a lot of products from the day featured and also some recent pieces I’ve picked up that have really blown me away. MyChelle kindly gave me their new Refining Sugar Cleanser and Hyaluronic Serum to try so I could reverse the effects showing up on my areas of dryness and texture, and so far they’ve been working amazingly – then again, I’m never surprised anymore when it comes to MyChelle as they always hit the nail on the (black)head. With a bag filled with trade goodies and snacks, we emerged into sunny East London and enjoyed some rest before Angelica and I went our separate ways. 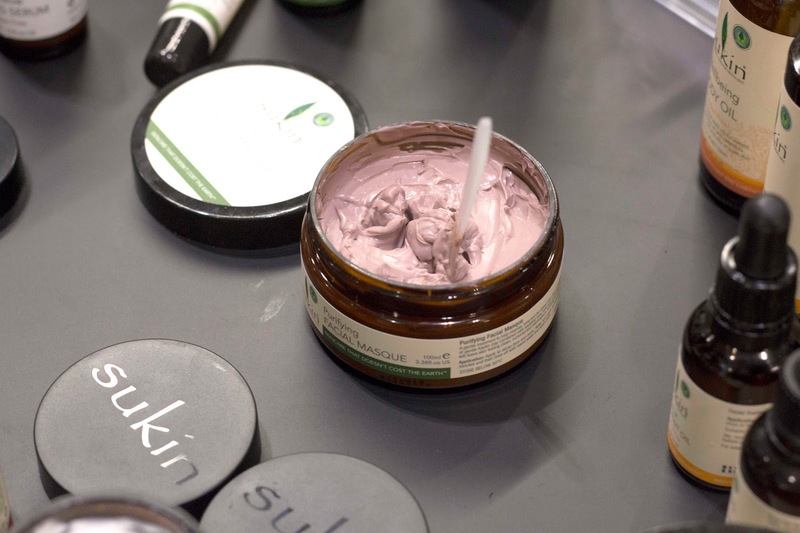 NOPE 2015 was such an informative Trade Show and one I hope to attend again next year, my eyes have been opened to so many great brands that all work to benefit the body, mind and soul, and I think a lot of them have quickly become favourites in my daily routine which is just a sign of how great natural products are these days. Thank you again to Fuel PR and MyChelle for inviting me down, and as for my list of things I’m excited by in life, you could say there’s NO(PE) turning back on natural living now! Have you heard of NOPE? 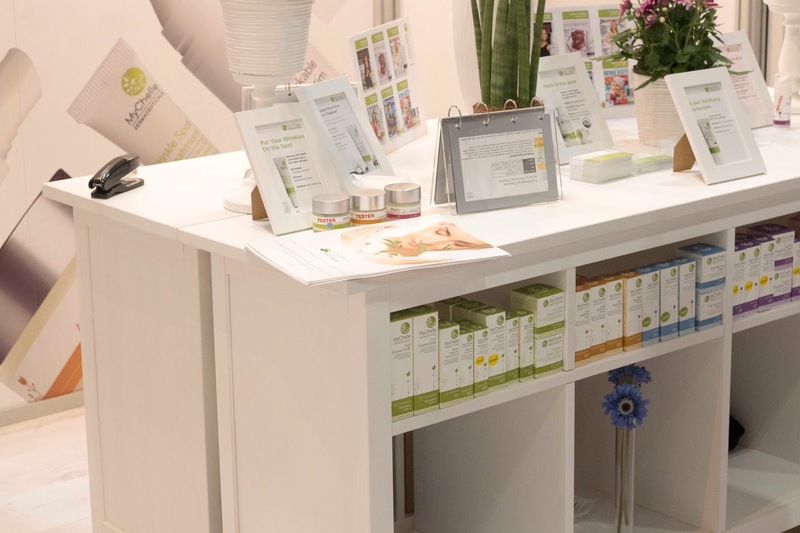 Did you attend the trade show this year? 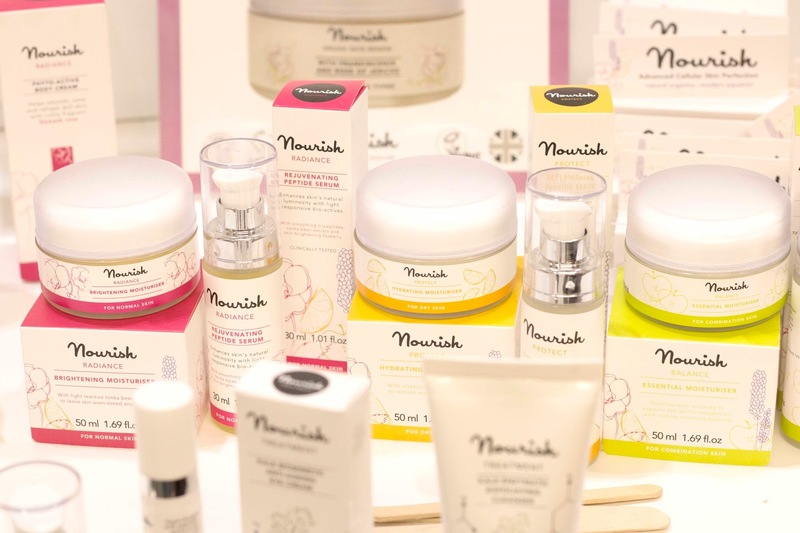 Are you a fan of natural skincare and beauty?